I’ve just made a prototype board for Slither. It’s pretty raw yet (you might likely need to reload the page first time...) and doesn’t enforce the rules, but hey, it’s an early release. I followed your suggestion, thank you. Could you please add something to remind the directions as for an old game it is not always obvious? Also I need a button for the arrows because apple devices are known not to have arrow keys (nor keyboard on your page). Yup, I have a tablet myself, so I’m in one boat with you here. I plan to add both features in the next version. 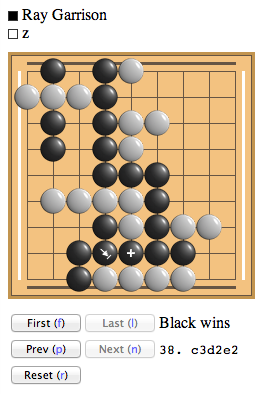 I don’t mind if the script doesn’t enforce rules (my goban doesn’t either), but apple device support would be great. That’s awesome. I had no problem with it (on Firefox on a laptop). Oops. That should have been “William Fraser” commenting above. I’m “just a bot”. maybe it doesnt work from Chrome? You have to copy the link of your game and then press “game from lg” ... this is working with chrome. You could ask the webmaster to add a direct link as for the other games ! I’m just doing it right now with firefox, it is definetly working well. I noticed that it is possible to place an incorrect move with diagaonal connection. Would it be hard to prevent it? Well, it shouldn’t happen if you paste the game URL or ID in the text box before pressing the button. I’ll fix that when I get my hands on it. > Would it be hard to prevent it? Thanks na_wspak. It wouldn’t be hard. I haven’t worked on it since then. Hmm, maybe I should have another look. Here’s a little something that could get rid of that URL copy-pasting depending on your browser. then you can press the bookmark to open the board. Wastes bookmark space though, so it’s not a perfect solution. Great job, alihv! Beautiful and smooth. One suggestion: when a stone slides, it often passes below other pieces on the board. That looks a bit weird. I think it would be better if it always passed over them. I’ve created an alternative at http://www.trmph.com/slither/board. Very nice board, thanks, z! It seems there is still a slight problem when performing the moves (maybe it’s meant that way, but I doubt so): one can slide more than one stone before dropping a new one.